Blue Water Sailing School gives students the tools they need for a lifetime of new adventures. Every so often, a graduate will send us an update about how they’re using their Blue Water education to change their lives, or even the lives of others. If you have a story that you’d like to share, send it in and it may show up here! Drew first sailed with Blue Water on a Christmas trip with friends, taking Course A + Bareboat. He later came back and took Course C, then completed his training with our Offshore Passagemaking course and a journey from Fort Lauderdale to Saint Thomas. 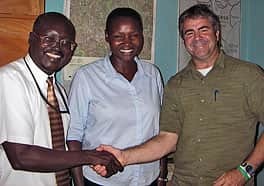 A successful businessman in Geographic Information Systems, Drew had a dream to bring GIS training and mapping services to conservation and humanitarian organizations, especially in developing countries. To do this he launched Service at Sea, a program of the non-profit GIS Institute that’s dedicated to accomplishing this mission. In the summer of 2006, Drew went on GIS training and support tour of six African nations. As of fall 2007 Service at Sea is preparing to launch the first leg of a multi-year cruise, visiting locations in all over the developing world. You can read more the program’s mission and progress on the Service at Sea web site. Already an experienced sailor, Marciano took Course A + Bareboat Chartering and Course C (advanced coastal cruising) to fine tune his knowledge and obtain ASA certifications. He now owns and operates a charter sailing yacht in Aruba. Mike and Amy took Course A + Bareboat Chartering in August 2007, having never been on a sailboat before. Upon returning to their native Colorado, they purchased a Catalina 250 (see photo at right) to sail on local lakes.